Our Gig cars are currently in a handful of lots in San Francisco and a zone in the Richmond District where you can begin and end your trips in these lots, whether you're coming from the East Bay or just running around San Francisco! Simply scroll over San Francisco and you'll see the locations plus the number of cars available. Free parking and no surge pricing means more exploring the City. Get directions and details about each lot in the map below. Each lot operates a bit differently; some have valets, some have specific hours of operation, and some are just park and go. Pick up and park Gigs from the marked spots in the HomeLot. If there's a valet, ask them for directions. If there are no open spots, ask the valet for help or call Member Support for help. The map features all our San Fransisco lots with directions to the next closest if there are no open spaces. Follow parking attendant's instructions when starting and ending trips. Call Member Support for keycode for after hours entry at 800-464-0889. 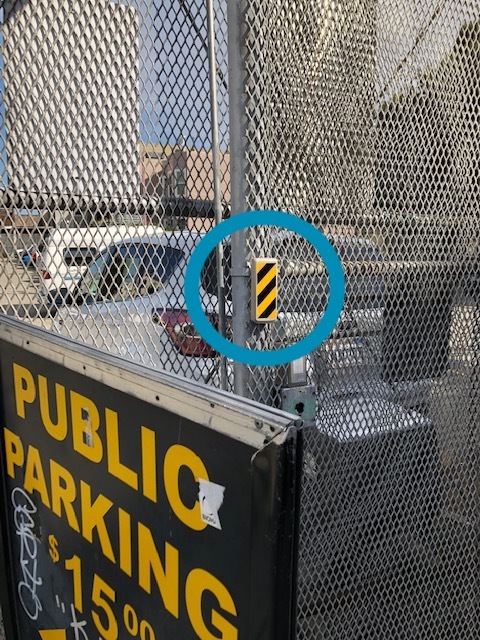 Locate the yellow and black keypad to the right of the gate and punch in the code to open the gate. There's another keypad on the inside for when you leave the lot, you use the same code. During normal business hours a valet is present, they'll give you directions. There are two entrances for the parking lot—one on the 3rd Street side and another on the Harrison Street side. Valet or self-parking. Ask the attendant for help and, if possible, tip generously. After valet hours, enter the lot, find a Gig, and start your trip as normal. Ending your trip: park in Gig’s designated spots (second row). If they are filled, park in any other open space in the lot. To end your trip park in Gig’s designated spots, immediately to the left as you enter the lot. If they are filled, park anywhere in the lot. As soon as you enter the lot, Gig spots are on the right, by the blue wall. When ending your trip, park in Gig’s designated spots. If the stalls are already full with other Gigs, you can parallel park blocking the Gigs. Feel also free to connect with attendant for help parking your Gig. Ending your trip: Park in Gig’s designated spots. If they are filled, park anywhere in the lot. The exit is located on Precita Avenue and it is opposite the entrance at the back of the lot. Ending a trip: park in Gig’s designated spots, on the right side, by the lot attendant. If they are filled, park in any other open space in the lot. Park in Gig’s designated spots, on the right as you enter the lot. If they are filled, park in any other open space in the lot. There are three designated Gig spots, park there first, if those are filled park anywhere that's free. There's a valet at the lot Mondays through Saturdays, if the valet is present ask them for directions. Valet or self-parking after hours. When valet is present ask for directions and tip generously. After hours simply park in any open spot. During valet hours defer to the attendant for instructions. If no valet present, park at Gig’s designated spots near Bay Street. If dedicated spots are filled, park in open spot in the lot. Remember, always end your ride in the app before walking away from the Gig. We're here to help. Contact our 5-star Member Support at (800) 464-0889. Ready to download the GIG Car Share app? Find it for iOS and Android here.